The EERC is pleased to welcome back Rob Klenner to the EERC as a Principal Geoscientist. He will lead geological evaluations for CO2 enhanced oil recovery (EOR), CO2 storage, unconventional hydrocarbon recovery projects and geomodeling and simulation efforts. He holds a Master’s of Science and Bachelors of Science degrees in Geology from the University of North Dakota (UND). It has been great working on projects that really impact the region. Conceptually testing technology is one thing; demonstrating its possibility is another. The state of North Dakota is fortunate to have an organization like the EERC exploring all the possibilities to keep North Dakota as an energy leader,” he added. 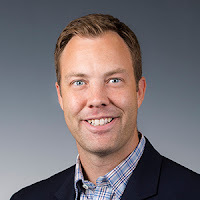 Prior to his return to the EERC, Rob was a Senior Geoscientist with Baker Hughes, a GE Company, where he was the reservoir analytics leader, creating subsurface machine learning solutions and services. Prior to that, he served as Lead Geoscientist with GE Global Research, where he was a key member of the team that initiated the reservoir program for their Oil and Gas Technology Center. Rob previously held the position of Geoscientist at the EERC, after having served as a Geophysicist Intern for Calpine Corporation at The Geysers, the world’s largest geothermal field. Rob’s principal areas of interest and expertise include reservoir modeling, petrophysics, unconventional resources, petroleum geology, geothermal energy, machine learning, and commercialization of research and development. He has authored or coauthored publications in the fields of CO2 storage, EOR, geothermal energy, and machine learning solutions for upstream oil and gas. It’s great to see the coordination of the greater organization and how everyone plays on the same team. This is a key strength of the EERC and has helped me fit in and feel welcomed,” Rob said. Originally from Freeman, South Dakota, Rob met his wife, Anita, at UND. She works for Grand Forks Public Schools as a speech therapist. They have two children, a son who is 6 and a daughter who is 4. Both kids like to play soccer and basketball through the YMCA. While Rob has long been an avid Vikings and UND hockey fan, the family also became OKC Thunder and OU Sooner fans while in Oklahoma. Rob said they look forward to visiting their families in Michigan, North Dakota, Minnesota, and South Dakota more frequently now that they live closer.